Submitted by Taps Coogan on the 17th of April 2018 to The Sounding Line. One rarely discussed aspect of the Federal Reserve’s response to the 2008 financial crisis is how profitable it has been for the Federal Reserve itself and for the US federal government. As a result of its efforts to suppress interest rates in the wake of the financial crisis, the Fed has amassed an enormous $4.5 trillion pile of interest bearing assets via its QE programs. As a result of its new assets, the Fed collects tens of billions of dollars a year more in interest income than it did before 2008. As per its charter, the Fed uses this revenue to pay its roughly 22,000 employees, cover its various expenses (roughly $4.5 billion), and pay its shareholders a 6% annual dividend. Whatever is left over is paid to the US federal government. The Fed paid the US federal government $91.5 billion in 2017 alone, compared to an average of about $25 billion in the years proceeding 2008. However, these large profits may be coming to an end as a result of a critical Fed rule change that was instituted in the wake of the 2008 financial crisis. Beginning in 2008, the Fed started paying banks interest on required and excess reserves that they deposited at the Fed. The new rule was aimed at preventing interest rates from falling too low or inflation rising too fast as a result of the excess liquidity that the Fed had created. Because of the new rule, banks chose to deposit trillions of dollars of the newly created excess liquidity at the Fed and started collecting interest while taking no risk. Ten years later, as interest rates start to rise once again, so has the interest rate that the Fed pays banks on their reserves. The interest on excess reserves rate (IOER) has risen from 0.25% at the end of 2015 to 1.75% today. As the Fed raises interest rates, the IOER rises in-lock-step. If the Fed raises interest rates two more times this year and three or four times next year, as most analysts expect, the Fed will be paying banks as much as 3.25% on their reserves by the end of 2019. Assuming that reserve balances remain constant at around $2.1 trillion, the Fed will go from paying $25.9 billion a year to banks in 2017 to as much as $68 billion a year at the end of 2019. 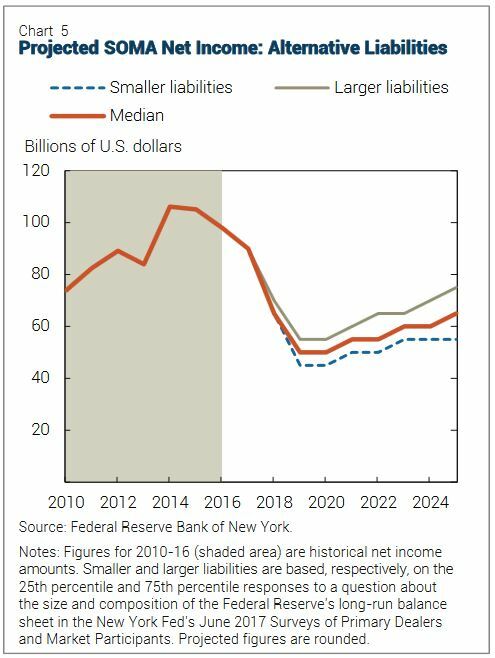 At the same time, the Fed is reducing its asset holdings as part of its balance sheet normalization scheme and thus expects to sees its own revenues fall. As a result of rising payments to banks and decline revenues, the Fed will be making much less money in the future. The Fed’s own calculations show that it expects its net income to fall from around $90 billion today to around $50 billion by 2020. The amount of money that the Fed passes on to the US federal government will decline proportionality. It is also conceivable that the Fed’s net income will fall further than it projects. As of now, there are no limits on how much money banks can deposit at the Fed. Banks could decide that the risk free returns they earn at the Fed are better than the returns available in the actual economy and reserves deposited at the Fed could increase. That could eventually create a funding issue for the Fed or make it reconsider its plan to reduce its assets. It will also deprive the US federal government, and by extension US taxpayers, of tens of billions of dollars a year in revenue. Considering that Congress and the federal government are planning to dramatically increase US deficit spending in coming years, the decline in revenues from the Fed is yet another worrying convergent trend. There has truly never been a better time for the US federal government to reduce its deficit spending. Unfortunately, there is little indication that Congress is even trying. P.S. We have added email distribution for The Sounding Line. If you would like to be updated via email when we post a new article, please click here. It’s free and we won’t send any promotional materials.